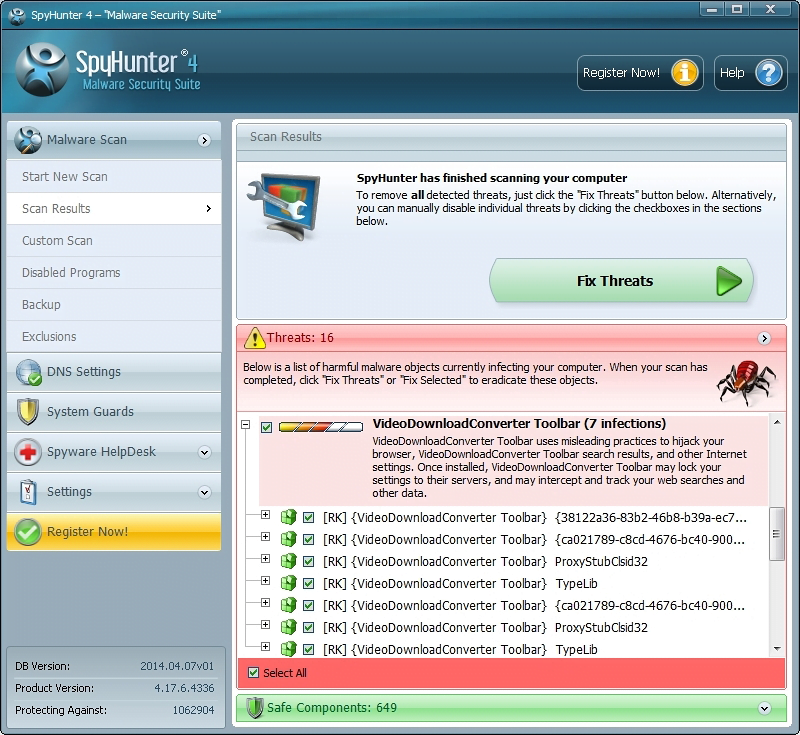 SpyHunter features outstanding protection against the prevalent types of malware. 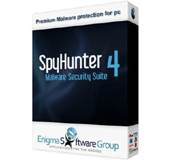 SpyHunter by Enigma Software Group is a lightweight security suite designed for real-time protection against a variety of malware. Whereas the name hints at a somewhat restrictive area of expertise, not only does this utility efficiently combat spyware proper – its sophisticated technology is also well fit for detection and removal of worms, adware, tracking cookies, trojans, keyloggers, dialers, rootkits, browser hijackers, malicious toolbars, rogue optimization tools, fake antiviruses and other unsafe objects at large. 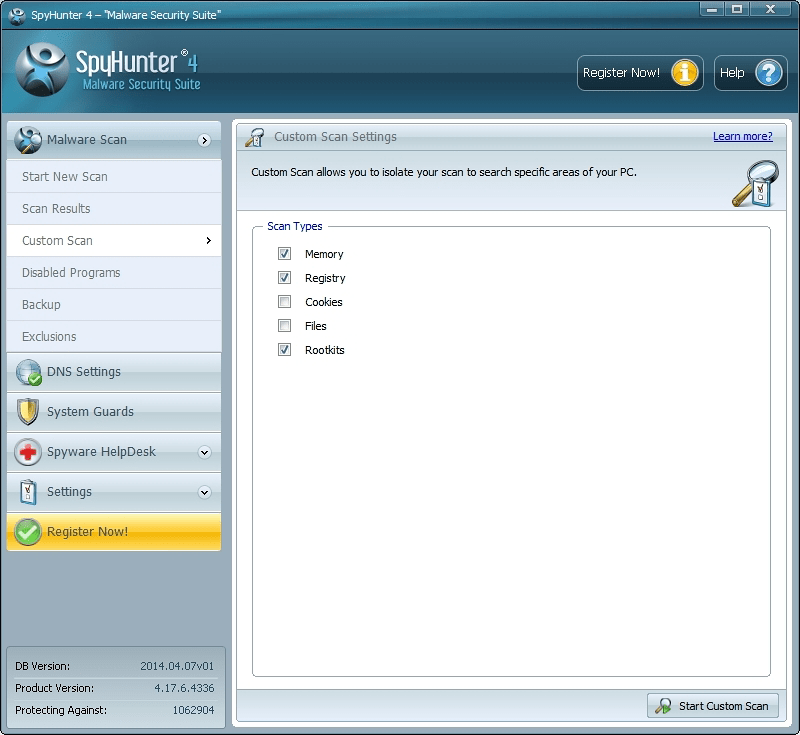 One of the key benefits of using SpyHunter is the fact that it features a number of free scanning options: quick, full system and custom scan. By default, the program runs a quick scan immediately after completion of the setup process in order to diagnose the computer’s current security state from the start, which is a great idea in terms of appropriate defense provision. The Scan Scheduler feature allows configuring the suite to automatically run scans at a certain time on a daily, weekly or monthly basis. In this context, it makes sense pointing out the thoroughness of the scanning process – SpyHunter managed to detect the threats that competing software missed on the test machine used for our software evaluations. Overall, the well-balanced mix of System Scan, unique Spyware HelpDesk, the behavioral analysis by System Guards functionality, and the Compact OS features make this suite highly effective for real-time detection and cleanup of known and new malware regardless of its severity. 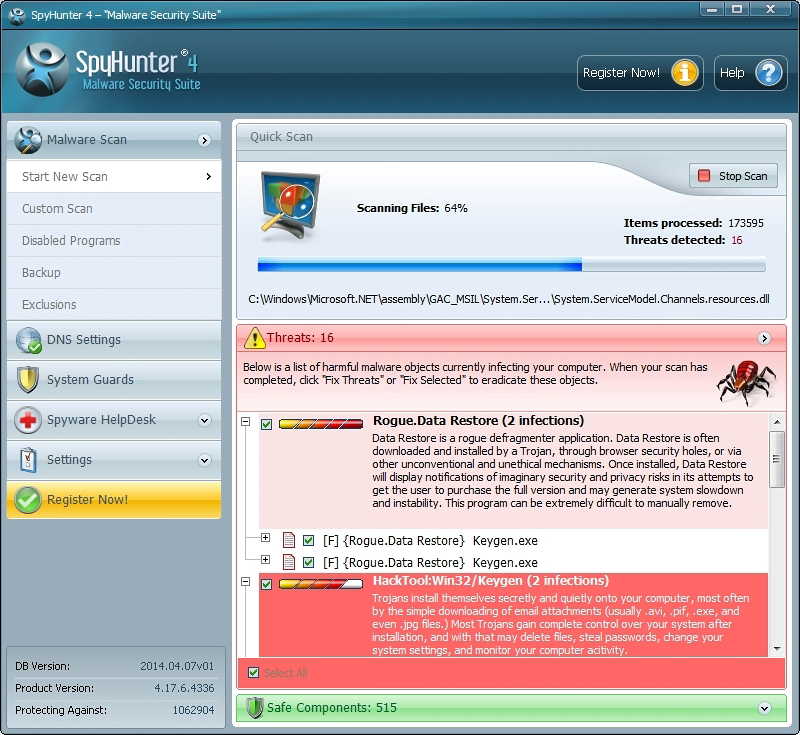 Getting SpyHunter up and running is neither complex nor lengthy. The stub installer which is only 712 KB large is tailored to provide smooth, intuitive and non-intrusive setup. Once clicked on, the Wise Installation Wizard downloads the software proper to the system, the only manual technicalities being EULA acceptance, selection of the preferred language out of 14 available, and the opt-out suggestion of allowing the suite to protect Internet Explorer homepage settings. The setup phase being completed, Enigma Updater downloads the latest malware definitions, which is a matter of literally a minute. The update is immediately followed by a Quick Scan getting launched automatically. In our case this initial scan took a little more than 20 minutes, which might appear somewhat time-consuming but its scrupulousness and returned results definitely make up for the wait. The scan report is extremely informative, listing the detected items with detailed descriptions and the entire hierarchy of the malware components. 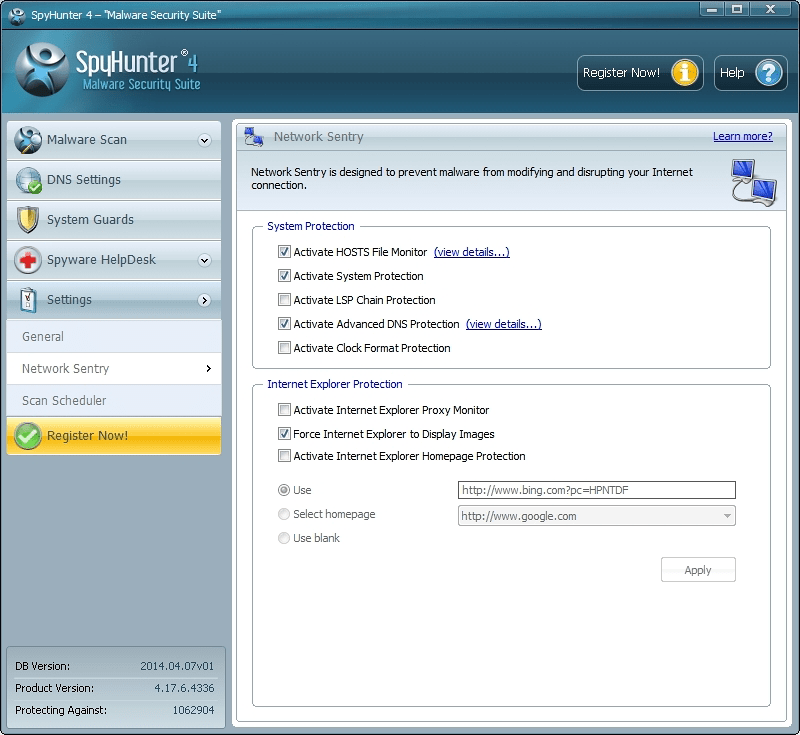 As part of its functional routine, SpyHunter alerts the user on potentially suspicious processes whenever an unknown application attempts to execute. There’s room for user discretion here as the suite asks whether an app should be allowed to launch. For less intrusion, the respective System Guards feature includes a built-in whitelist of trustworthy Windows executables, while the others can be disregarded further on if the user wishes so. The program’s interface turned out easy to use. The key features are grouped in the left-hand navigation pane, with the details being displayed in the main section to the right. While the GUI is kind of bulky and not quite as slick and graphics-rich as some competing programs have, it’s perfectly intuitive and definitely matches the purposes it was designed for. 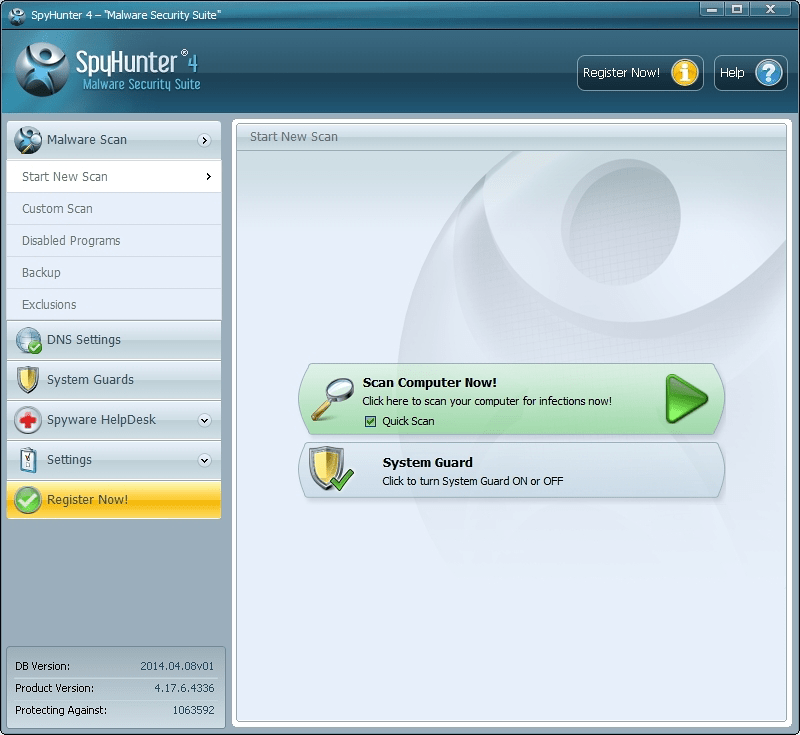 In terms of computer performance impact, SpyHunter 4 is commendable in that it delivers great protection without slowing down the system at all even during daily definition updates, scans and the real-time defense. Malware Scan is a multi-level analysis procedure splitting the scanned objects into three clear-cut categories: Threats, Safe Components, and Unknown Files which get temporarily disabled until additional data is available. The filtering algorithm implies a blend of whitelisting, blacklisting and heuristics for checking the memory, system registry, cookies and files for potential threats. A standalone stage constituting this process is checking the PC for rootkits. Users can customize the scan process by prioritizing the locations to monitor and the objects to check for. 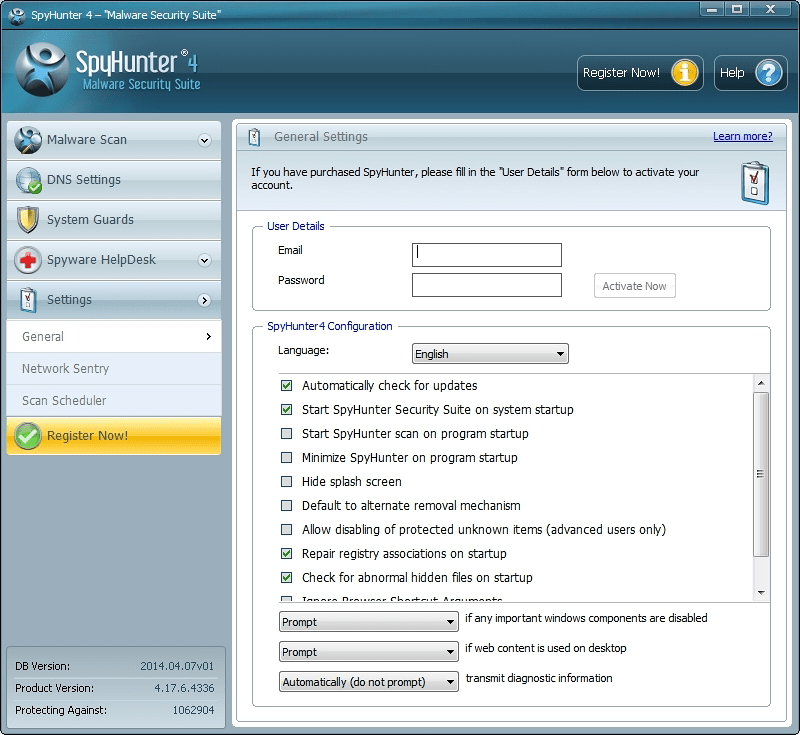 SpyHunter 4 accommodates extensive scan scheduling options by scheduled time and scheduled pattern. 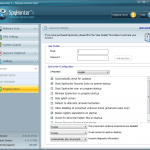 System Guards is a smart proactive defense feature. It monitors processes as they are executed in real time and notifies the user in the event a potentially harmful or unidentified code (possibly a virus, malicious ActiveX object, etc.) tries to run on the PC. Each time this happens, SpyHunter comes up with an alert about unknown object execution, where you can either allow or block it. The opt-out ‘Remember answer’ can spare you of having to react to the launch of any particular process in the future, if you are sure it’s safe. All in all, the System Guards functionality puts you in full control of what gets executed on your computer. Persistent infections can be taken care of with the Spyware HelpDesk feature. In case of severe contamination or inability to remove a bad item the regular way, registered users can benefit from the capability of generating a support log that includes diagnostic details specific to their computer. 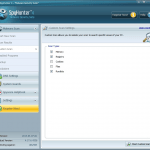 The log can then be transmitted to the Support Center and scrutinized by a SpyHunter expert who will come up with and send the user a customized fix to address the issue. Once received, the custom fix can be activated in a single click – as easy as that. 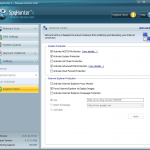 The Network Sentry features are tailored to prevent malicious software from changing your Internet settings to untrustworthy values. You will be alerted any time a malign code attempts to modify your DNS server configuration, LSP chain or Windows HOSTS file. As a result, you will be using only trusted DNS and Layered Service Providers, and phishing attacks won’t get through because the resolved URLs will correspond to genuine websites only. The Network Sentry also accommodates browser homepage protection to secure the web browser preferences from getting modified by malicious Browser Helper Objects such as toolbars, extensions, add-ons, etc. SpyHunter has been Checkmark-certified by the West Coast Labs, one of the world’s most reputable facilities for testing InfoSec products and services. Also, the software’s latest version boasts Bronze Antispyware Certification by OPSWAT confirming its compliance with the top-notch security industry standards. During Soft2Secure evaluation, SpyHunter has exhibited its best traits and capacities. It did a great job at malware detection, finding six malicious objects none of which had been spotted by other antispyware products we tested. A special observation of ours is the suite’s high ability to detect browser threats such as hijackers and adware, as well as rootkits – despite the obfuscation these infections tend to leverage. 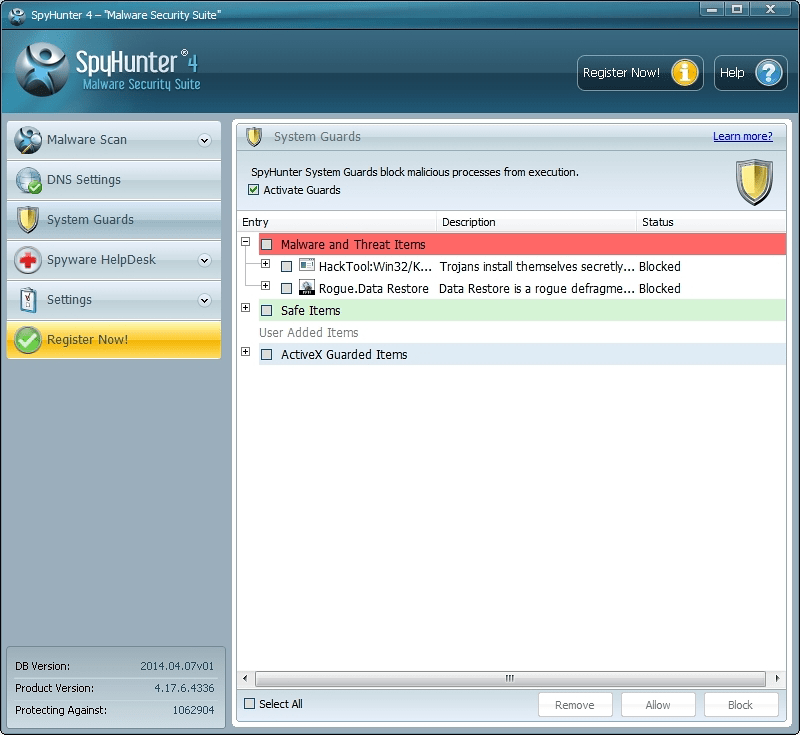 We ran into no cleanup and system remediation issues whatsoever; SpyHunter handled the threats smooth and fast. 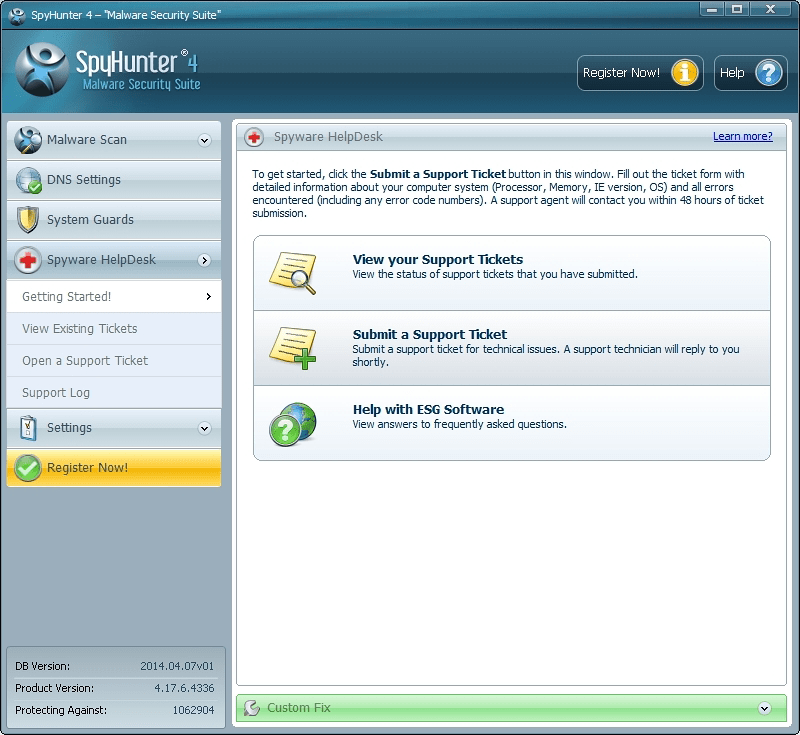 To get general product information and basic troubleshooting knowledge, it suffices to click on the Help button which is built into SpyHunter interface. The respective linked-to web page contains an easy-to-navigate and detailed user guide with illustrations on the features and settings of interest. 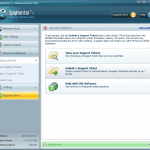 In case a serious malware issue is encountered, users can go to the Spyware HelpDesk and submit a support ticket or transmit a previously generated support log to a live technician for a custom fix. 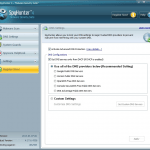 To address yet more critical virus problems, there’s an option of contacting live technical support to get the threats manually removed through a remote connection with your computer. 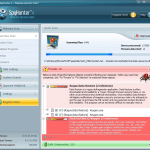 As far as real-time defense against a broad spectrum of malicious software is concerned, SpyHunter 4 Malware Security Suite is close to a perfect match. If effectively confronts both known and 0day infections due to a combination of thorough scanning algorithms and heuristics. Severe contamination scenarios can be addressed via custom fixes created by live support technicians. Moreover, SpyHunter barely impacts system performance, ensuring trouble-free user experience along with a permanent sense of being reliably protected.